The Chevrolet TAHOE is a traditional body-on-frame 3 row SUV, providing large families with the space, function and cargo capacity others can not match. 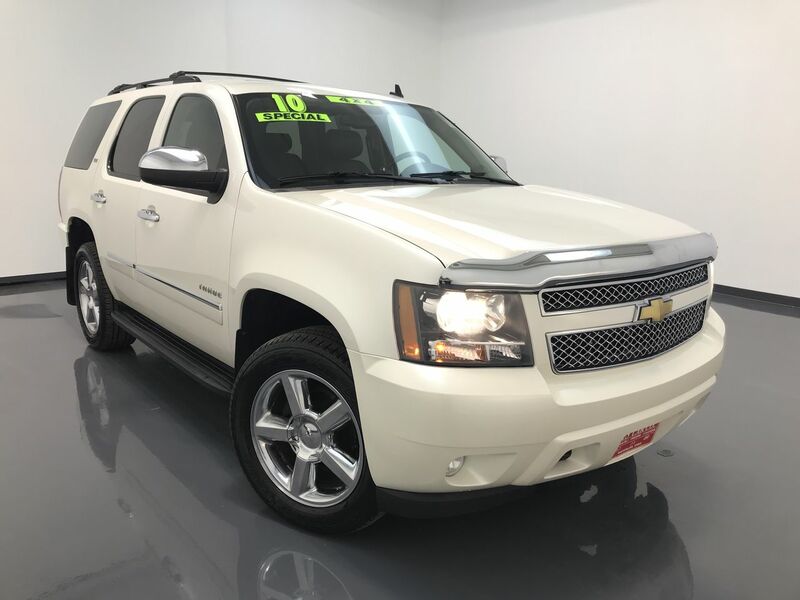 This 2010 TAHOE LTZ 4x4 has a full leather interior with four heated seats, cooled and power assisted front seats with a 2 person memory for the driver's seating position, as well as power adjustable pedals. There are three climate zones, a sunroof, keyless entry, wood grain interior accents, and a back-up camera with sensors. The Tahoe also has a power rear lift gate, power folding exterior mirrors, and blind-spot detection. The Bose touchscreen infotainment system has navigation, XM satellite radio, Bluetooth connectivity, and an AM/FM/CD unit, as well as a DVD system for the rear passengers entertainment. The exterior is set off with the 20" alloy wheels with Bridgestone tires, running boards, a Stampede chrome front hood bug deflector, and a roof rack with cross rails. Call C & S Car toll free at 866-212-8718 or locally at 319-291-7321. Air bags, head curtain side-impact, first and second row outboard seating positions with rollover sensor, includes third row seating positions with (AS3) passenger third row bench seat (Head curtain side air bags are designed to help reduce the risk of head and neck injuries to front and rear seat occupants on the near side of certain side-impact collisions. Always use safety belts and the correct child restraints for your child's age and size, even in vehicles equipped with air bags.